I believe I may have mentioned that I have been all about the beets this summer. They are beautiful and sweet and I just can't get enough of them. I have put them into stir frys and sauteed them with radishes and green beans, but once summer came into full swing I have been putting them into salads, with much success. I have played with all kinds of combinations, using all of the great finds I have made at the green market. I generally use the same basic ingredients - greens, celery, green or red onion, and of course, the beets. And while I can say that they were all delicious, some were more successful than others. Like this one. This is one of the ways I utilized the apricots that have been so bountiful. Celery adds a nice crisp counterpoint to the soft sweetness of the beets, and the cherry tomatoes add a burst of flavor. A nice vinaigrette finished off this salad beautifully. And this salad, that I already wrote about here, really highlighted the beets. The onion and celery flavors blended in flavor as much as they did color, and the walnuts added a nice soft undertone of flavor. Several years before I started blogging I made a salad using blood oranges and goat cheese that I found in a book called Great Greens. That was about the same time I discovered blood oranges and I was happy to have found a recipe that specifically called for them. The recipe included a blood orange vinaigrette, which I think is what inspired me to adapt my weekly vinaigrette recipe to incorporate the blood orange vinegar and infused olive oil that I discovered a couple of years ago. I think that's also what gave me the idea of combining beets and oranges again. That, plus I happened to have a couple of mineolas in the refrigerator for which I needed to find a use. I knew they would be good together, but I wasn't sure what else should go with them. I didn't really have anything on hand that would add any crunch to the salad, so I knew I wanted nuts. The walnuts had added a lovely depth to the earlier salad, but they are a relatively soft nut and I didn't think they would provide a strong enough crunchy contrast to the softer beet and orange. 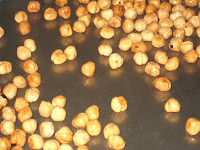 I remembered that I had some blanched and peeled hazelnuts in the freezer that I bought when I made the Romesco Sauce. They are a firm nut, and crunchy. I took some out and roasted them. They came out with a lovely golden crunch. And helped to make what I consider to be the best beet salad I've made so far this summer. Combine all of the salad ingredients except for the cheese and hazelnuts and toss well. Combine the vinegars, orange juice, oregano, salt and pepper. Combine. Add olive oil slowly, whisking constantly. Add the garlic. Just before serving, add the cheese to the salad. Add the dressing and toss well. Add the hazelnuts to the salad and serve, or garnish each individual plate with the nuts just before serving.